NetDMX is an ArtNet/sACN(E1.31) to DMX512 interface. It is capable of creating a single universe differential DMX output from ArtNet/sACN over a wired Ethernet network. 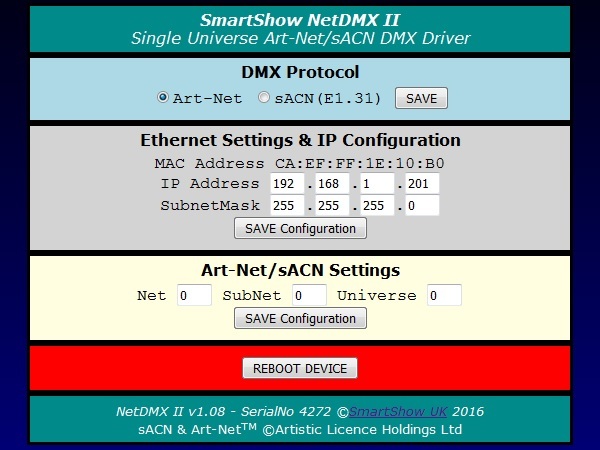 Device IP and ArtNet/sACN Settings are adjustable directly from your Browser interface, or from a USB/Serial Application (see HTComm [link]). A single 3-pin DMX output plug is provided to connect directly to your target DMX system. Operational Mode is indicated by a simple 7 segment display.